The C.A.T. M4 and CAT-762 tools addresses the critical areas of the bolt and bolt carrier assembly and the carbon buildup that collects on the operating surfaces during prolonged firing. 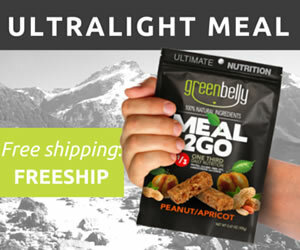 They are lightweight simplistic tools that has five functions in one compact rugged field ready design and it is totally American manufactured. It is investment cast from 300 series stainless steel and then the bolt cleaning chamber is CNC machined to precisely fit a mil-spec bolt. 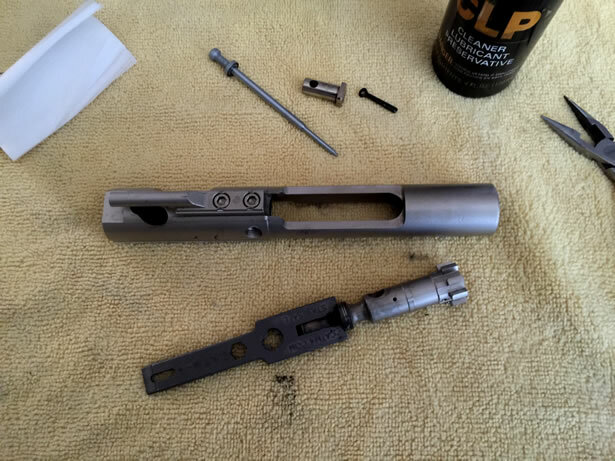 Anyone who has ever had to deal with that inevitable carbon buildup on the bolt carrier group in an AR-15 or AR-10 certainly understands just how tedious that process can be. Especially if you don’t clean them regularly. 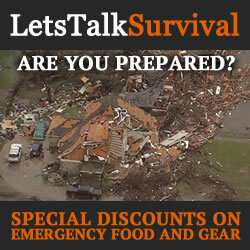 However, there are a few tools out there designed specifically to help with that chore. Today, I’ll be looking at the C.A.T. M-4 tool and CAT-762 tool from CAT Outdoors to see how well they work. The C.A.T. M-4 TOOL is designed for the AR-15 with a .223/5.56 caliber bolt carrier group and the CAT-762 is designed for the AR-10 with a .308/7.62 caliber bolt carrier group. The two CAT Outdoors tools are made entirely in America, investment-cast from 300-series stainless steel for extreme durability. The bolt cleaning feature is then CNC machined to precisely fit a mil-spec bolt. Different materials and manufacturing processes can greatly affect the tolerance. Therefore, the CAT tools may fit some bolts better than others. 1) Bolt Cleaner/Scraper: The bolt cleaner/scraper is designed to quickly remove carbon buildup from the bolt. To achieve a tactical tolerance, simply insert the bolt tail into the end of the CAT tool and twist it back and forth until the buildup has been scraped off to your satisfaction. I find this feature to be one of the most important uses for this tool. To further clean the bolt and reach inspection-ready cleanliness, just add your favorite solvent and some patches to the process. 2) Firing Pin Flange Cleaner: To clean the firing pin flange, simply drop the pin through the CAT tool so the pin flange fits down into the recess and twist it back and forth until the buildup has been removed. Use solvent and patches to further clean the firing pin as needed. 3) 1/4″ Hex Head Wrench: This may be a useful feature for some if you ever need to use a hex bit to loosen or tighten something. 4) Patch Hole: This slot is used for gripping a patch when you are cleaning the inside of the bolt carrier. Simply insert the corner of the patch into the slot and fold it over the carrier cleaner/scraper. 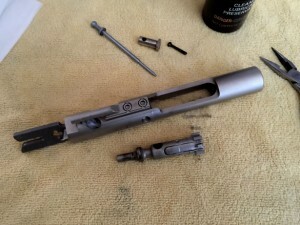 5) Carrier Cleaner/Scraper: Like the bolt scraper, I find this feature to be most invaluable in reaching one of the most difficult areas on an AR to clean. To use, simply insert the end of the CAT tool into the bolt carrier and twist back and forth until no more carbon buildup comes off. Then use a patch to further clean the bolt carrier surfaces. Adding solvent will help loosen any remaining buildup and make it easier to reach the level of cleanliness that you desire. I spend quite a lot of time cleaning firearms. I just can’t stand the thought of putting one away dirty. Most of the time I like to clean and inspect them before I pack them up for a trip to the range, and then again when I get back before I put them away. And sometimes in the field whenever necessary. As a result, carbon buildup is easily a bane of my existence. So when I run across a tool that makes it bearable, I have to put it to the test. I’ve used the C.A.T. M-4 Tool a few times now and found it quite impressive. It works very well… Especially when used with Break-Free CLP. It has cut the time that I used to spend cleaning ARs by at least half, if not more. It has easily been worth every penny! Sam Johnson, the owner of CAT Outdoors, Inc. grew up in a small Missouri town. His passion for shooting began at the young age of 9 when his Dad would give him instruction and a brick of 22 shells on the weekends. It didn’t take Sam long to figure out his Dad was not just an ordinary shooter. Soon Sam was following in his Dad’s footsteps with a knack for hitting any target. Working in the family business had its benefits as Sam realized an early age. Not only did he find the flexibility to pursue his passion of shooting but a sense of business and how the customer should be treated. “We were a hard working family and after the work was done then I was allowed to shoot.” In 1981, Mr. Johnson moved to Douglas, Wyoming and soon joined the Casper Wyoming Ghost Town Shooters. The nearest United States Pistol Shooting Association (USPSA) competition was in Nebraska and a one way trip of 130 miles. This did not stop Sam from pursuing his love of shooting. Soon in a college machine class, Sam started building his own guns. A lot of shooting leads to a need for cleaning. 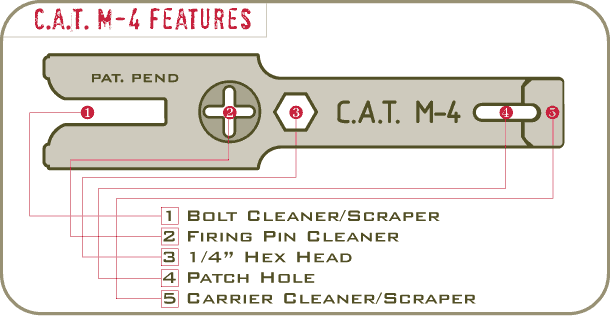 Through a series of trials and errors to produce the best multi tool for cleaning the M-4 carbine finally the CAT M-4 Tool was born. Soon after came the Talon Tool Lug Scraper, the CAT 762 and then the Lynx 1911 Bushing Tool.